Having spent the weekend, soaking up the most delicious wedding vows, I thought I’d dedicate this post to vows and looking at alternative ways to do and say them. When it comes to personal vows, most people are only aware of the popular standard format for them, which is basically where the couple take turns to read their vows to each other. These vows can either be pre-written statements that they like the sound of, and wish to pledge to each other, statements that the couple write together and say to each other or statements which the couple work on individually and say to each other during the ceremony, and therefore hear them for the first time, at that point! Joint vows can mean many things, but in this case I mean vows which are said together ie said jointly. The most usual way for joint vows to be done are where the couple say each line of their vows, one after the other, in an alternating style. 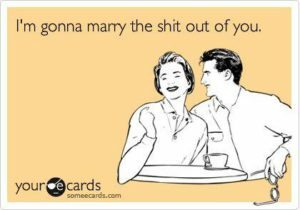 I love this style of saying your vows because it is so awesomely symbolic. I mean, you’re getting married, right? And you are basically making a commitment to being together, so why not then say your vows together? Making your promises together as a unit and outlining your hopes, wishes and plans as a united couple. This is us, this is how we feel and this is what we’re going to do with our lives! Love it. So let’s take a closer look at how this can be done. The couple plans together what type of pledges and statements they would like to say during their vows; the sentiments, the tone, the wording etc. They write their sentences together and they allocate who will say what sentences during the ceremony. Here is an amazing example of this. Justin: I promise to honour the commitments we make today, whether I am far from home or wrapped in your arms. Jennifer: I promise to remember how lucky I am to have someone that makes saying goodbye so hard. Justin: I promise to build a secret lab and fill it with minions for you. Jennifer: I promise to devise an evil plan to try and steal the moon for you. Justin: I promise to give you my undivided attention, as long as there is no football on TV. Jennifer: I cannot promise that I will always deserve you, but I promise I will try my very best. Justin: I promise to grow old along with you. Jennifer: I promise you, me. *I love to use famous married couples names when I give vow examples!!! The vows however, are very very real! Now, please also check out this awesome set. These vows follow the same style, in that the couple worked together on them and alternated their statements one by one, but their vow content differs slightly in that they talk more about each others’ attributes and how they make each other feel, as well as making promises and pledges to each other, which of course, I love! Victoria: I love you because you share everything with me. David: To love, support and honour you forever more. Incredible, right? Where the hell are my tissues? Hopefully, through the tears you’ll be able to see how these examples show how dynamic you can be with your vows and how personal and funny you can make them. The benefits in doing your vows like this means that a) you have planned in advance what both of you will write b) you can match all of your statements so that they work well together and reflect the two of you equally and c) saying them together is a fab way to express yourselves, as well as showing your unity at the time of saying the vows. Whoop! Awesome? Or Awesome? Having just recently had the pleasure of hearing vows being said in this way, I can confirm that I am totally in love with this vow style and look forward to hearing more of it. So in this version, what couples do is to again plan their vow structure, even down to the number of statements they will pledge and the tone and style of their statements. They may even go as far as using a method where the first two pledges are funny, the next two are serious, followed by one more funny one, and ending on a serious note, as example. This way guarantees that the pledges are pretty much in sync with each other and follow the same format. But how this vow format differs from the first version, is that the couple goes on to write their pledges individually, so they don’t know what the other has written until they say them to each other during the ceremony. Here is a beautiful example of this, so you can see how it can look for real. Giselle: I promise to put up with your mild OCD complex and clean things to the best of my ability, close the wardrobe doors and navigate better on Google maps. Tom: I promise to create an exciting, fun & adventurous life together where laughter is an integral part of our family. Giselle: I promise you the most exciting life, like riding the peak in Bundoran or macaronis in Bali but on dry land and a lot more consistent. Giselle: I promise to encourage your sense of adventure and go camping with you once a year and be a surf widow when the waves are good. Giselle: I promise to be worth the time, worth the trip, worth the energy and worth your love. Tom: I promise to be your support system, sidekick and best friend. To share your laughter & tears. I choose to spend today, and all of my tomorrows, with you. How perfectly do these two sets work together? Yep, amazingly! I love that the couples’ individuality is on display but that their vows come together to unify them. Love it. Did you notice how Google Maps seems to be working its way into people’s wedding vows!!! Bloody Google Maps and the challenges it gives us couples! Hilarious! 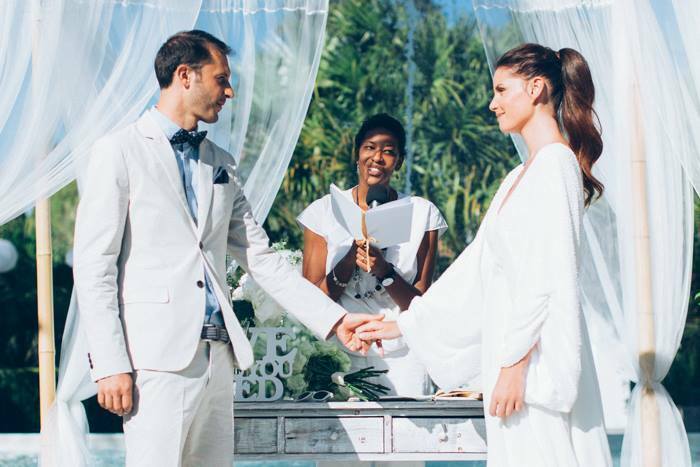 So, how do you feel about this style of doing and saying your vows? Naturally, I’m feeling all the feels over these ones and I hope you do too.